Mauritius’s IPRI score decreased by -0.06 to 6.249 placing it 3rd in the Africa region and 40th in the world. Mauritius is classified by the IMF as part of the Sub-Saharan Africa group and by the World Bank as Upper middle income country. Mauritius’s Legal and Political Subindex decreased by -0.01 to 6.520 with scores of 6.584 in Judicial Independence, 6.604 in Rule of Law, 7.256 in Political Stability, and 5.637 in Control of Corruption. Mauritius’s Physical Property Rights Subindex decreased by -0.14 to 7.086 with scores of 6.483 in perception of Property Rights Protection, 9.433 in Registering Property, and 5.342 in Ease of Access to Loans. 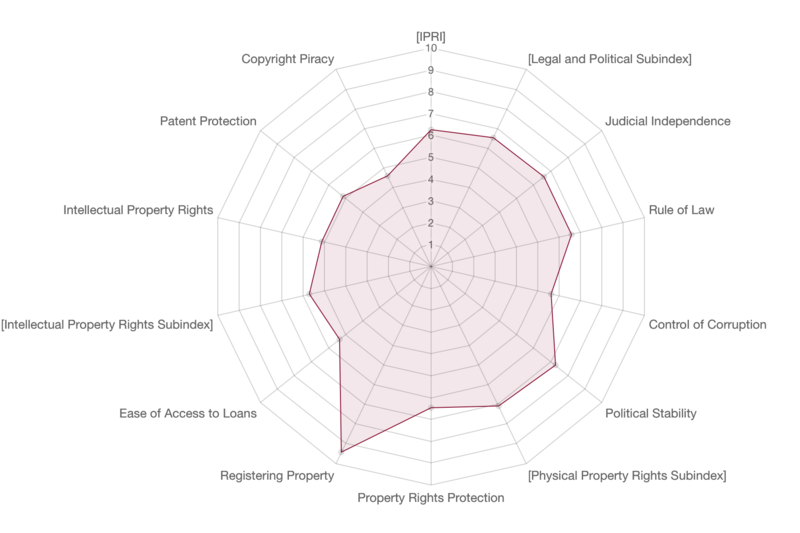 Mauritius’s Intellectual Property Rights Subindex decreased by -0.04 to 5.142 with scores of 5.693 in perception of Intellectual Property Protection, 5.133 in Patent Protection, and 4.6 in Copyright Protection.